Is there a hierarchy to varying types of leather used on Alpinas? I've seen a number of types: Lavalina, Montana, Nappa, Dakota, Merino. Some of these are standard BMW fare, or is there just different options depending on model year/base model used? Whats yours got? My old E36 alpina had an individual trim with montana leather and nappa piping. A montana trim was an uprgrade over standard leather back then and can wear the miles well if looked after. Alpina use lavalina only on their trims, you won't ever see it on cooking bmws or any M power car. Its deemed too nice for automotive use ive read and is used mainly on high end furniture. Not many UK cars get the lavalina trim treatment! 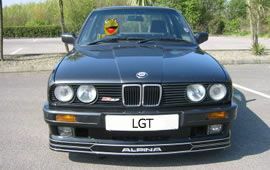 All alpinas from the e36 onwards get a lavalina steering wheel. Nappa tends to be used on M power cars like e36 and e46 M3s, its soft and can waer badly if not looked after. Merino was an E60 M5 thing i recall and an upgrade on the stock leather on those cars? Buffalo is another that can feature as an upgrade on older bmws and alpinas withs the recaro seats ordered -e30,e34 e36 era. I'm not certain what mine is to be honest. The original order invoice Gary gave me a copy of just says "LEATHER UPHOLSTERY LIGHT GREY" and the Alpina Archive lists it as "Leather Montana Light Grey". No contrast piping though. Dakota is definitely the standard leather option on F3x models, had it in my 420d in Oyster and that was a ok if you cleaned it weekly and didn't wear jeans!! Merino was the Individual option when i ordered mine. Had forgotten about Buffalo, I seem to remember that from E24/28 M5's too i think? LAVALINA is amongst the most natural and highest quality leather types available worldwide and offers all the advantages of untreated full-grain cowhide. It is cask-pigmented and is produced using the highest-quality hides sourced in South Germany. Silky smooth to the touch, this leather is unrivalled in terms of its surface texture, climatic comfort and appearance. Its natural qualities can be felt with every touch. It guarantees excellent temperature compensation and moisture regulation and is extremely breathable. In a special additional tanning process, the individual fibres of the cowhide are impregnated with precious natural oils. This preserves the properties of the natural leather, such as its silky and extremely soft touch, while at the same time increasing the resistance to wear and tear. The natural traces and marks of life remain visible on the surface of the leather and lend LAVALINA leather its unique characteristics, which are valued by connoisseurs worldwide. Mine has something called 'Aniline', which was a special order. From the factory visit in 2007 I seem to recall that Lavalina comes from a single herd of cows in Switzerland so supply can be a challenge. I think either Dakota or Monatana was standard to the E38 7 series but I have had Buffalo on an E38 but it's taken pretty much straight from the cow and still has any blemishes/scars in it from insect bites etc. I think on the E65 you had the choice of Nasca, Montana or Club (depending on the market) by default, Pearl on sports seats and Merino as an Individual interior. F01/F02 was Dakota as standard and either Merino or Nappa as an option. G11/12 is the same by my reckoning. Dakota is the basic leather, it is leather but has an embossed grain and lots of covering protectants. It is the hardest by feel, but the hardest wearing. For most BMWs this is the standard leather. Nappa is the next upgrade, which is softer, not embossed ie flat and has a lower level of coating, so wears more. It is/was standard in some higher-end models such as 7 series or certain M-Cars. Merino is the next upgrade again and is usually provided by BMW Individual, which is an expensive option on many models. It is again a higher quality of leather with even less protections again, so it is very natural, but therefore wears even more in terms of potential colour loss etc. Lavalina is Alpina own leather specification and is very expensive and akin to a more bespoke version of Merino, but as provided by Alpina with a different level of finish, coverage and colour options. I've not heard of the others, but don't believe they have been used recently. I - main part of seat and middle armrest section of door in Lavalina hide. The Lavalina II option on mine was £12k 10years ago, this included dash top. Last edited by PhillV8S on Sun Jun 17, 2018 8:07 am, edited 1 time in total. It might be better described as the entry level leather, particularly on 3er based cars, leather is usually an option over the standard cloth interior rather than the default. Platnium Merino in mine, had it all treated this year.